Deaf clubs for decades provided crucial points of contact for an otherwise isolated sector of the disability community. People would gather to enjoy social events, meet new friends, learn skills and seek resources and support. But changes over time have forced many of the clubs to close their doors. Additional access to assistive technology, more opportunities to participate in society and less interest in a club setting have hurt some clubs. 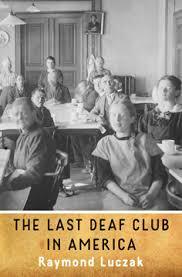 Author Raymond Luczak’s new book, The Last Deaf Club in America, is a work of literary fiction that draws on his own life experiences. He is author and editor of 15 books, including prose and poetry. In 2014 Luczak was in the first group invited to join the Anderson Center’s Deaf Artists Residency Program. Deaf artists not only discussed their own works but the future of their community and its gathering places. Luczak is an activist who admits that he may have been born too late, and that he appreciates the clubs’ history. He pointed out that the clubs thrived, and drew on the power of the community to organize against the hearing world and its misunderstanding of their ways. Ironically the loss of many of the clubs over time is a sign of acceptance as well as a growing awareness of American Sign Language (ASL). Many high schools and universities offer classes in ASL. “As I’ve always written literary fiction, The Last Deaf Club in America isn’t really a new genre for me,” he said. What is new is drawing on prominent past community figures as ghosts. Deaf club board of trustee members, who are reflecting on their club’s fate, met ghosts from the community past in the novella. The ghosts discuss the importance of the clubs in their heyday. Luczak drew on his 30 years’ knowledge of community history to develop four of the ghost characters. Deaf architect Olof Thompson, who designed St. Paul’s Thompson Hall clubhouse, is one of the ghosts. Another is Mabel Hubbard Bell, the wife of the community’s nemesis Alexander Graham Bell. Pioneering woman pilot Nellie Zabel Willhite and George Veditz, a charismatic activist who defended the community’s right to sign, are other ghosts drawn from history. A fifth is a fictitious character. Descriptions of the unnamed club that is central to the novella are loosely based on Thompson Hall, a place he has a lot of affection for, although Luczak is quick to note it isn’t the last club of its kind. Additional details are gleaned from the club stories the author has heard from other community members. Access Press is interested in reader submissions for the monthly History Note column, to complement the articles written by Luther Granquist and other contributors. Submissions must center on events, people and places in the history of Minnesota’s disability community. We are interested in history that focuses on all types of disability topics, so long as the history has a tie to Minnesota. We are especially interested in stories from Greater Minnesota. Please submit ideas prior to submitting full stories, as we may have covered the topic before. Contact us at access@accesspress.org or 651-644-2133 if you have questions. The History Note is a monthly column sponsored by the Minnesota Governor’s Council on Developmental Disabilities. Rental Housing by Mary T.